The optical image that confirmed that 2XMM J083026+524133 is a distant cluster of galaxies, taken by the Large Binocular Telescope in Arizona. The X-ray emission from the cluster of galaxies is shown in blue at the centre of the image. The individual galaxies in the cluster are the small dots inside the blue glow. Astronomers have glimpsed the largest cluster of galaxiesever seen in the distant, early universe. The discovery of this far-off group, estimated to contain asmuch mass as a thousand large galaxies, offers further proof of the existenceof the enigmatic force called darkenergy. "This is the most luminous, and therefore probably themost massive, clusterof galaxies discovered at this epoch," said Georg Lamer of theAstrophysikalisches Institut Potsdam in Germany, who led the team thatdiscovered it. "The light we observe started about 7.7 billion years ago.This is about half of the age of the universe, so it is from quite long ago, and quite far away." When astronomers look at distant objects, they are lookingback in time, in this case seeing objects that are 7.7 billion light-yearsaway. Lamer and his team discovered the cluster, known by itscatalogue number, 2XMM J083026+524133, by chance while they were surveying aportion of sky for a catalogue of X-ray sources. Using the European SpaceAgency's orbiting X-ray observatory XMM-Newton, they spotted an extremelybright object without any galaxy visible in optical light nearby. After noticing the aberrant object, they took a deeperexposure with the Large Binocular Telescope in Arizona and determined that thesource of the light was a far-off group of galaxies containing the mass ofabout 1,000 Milky Ways. The astronomers say the discovery offers further proof ofthe mysterious force called dark energy that scientists think propels theacceleration of the universe's expansion. Dark energy is believed to accountfor about 70 percent of the universe, with the remaining portion made up ofnormal matter and its enigmatic sister, dark matter. "The existence of the cluster can only be explainedwith dark energy," Lamer said. Since dark energy is contributing to the stretchingof the universe, and speeding up the process of galaxies receding from eachother, it hampers the growth of massive galaxy clusters in more recent times. To test dark energy, scientists compare frequency of thesemassive clusters today with earlier times. If there were no dark energy, theywould expect clusters to grow relatively quickly, so the largest clusters wesee now would be very small at half the age of the universe, and there would beno gigantic clusters. 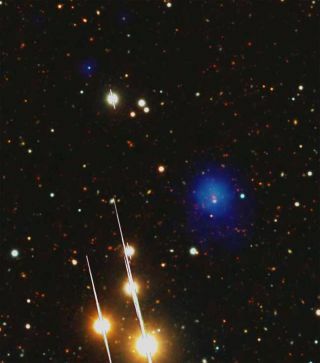 "The fact that we do find these clusters is a clearconfirmation of dark energy," Lamer told SPACE.com. "This wasa very long time ago and it's actually about as massive as the most massiveones we observe today. Without dark energy we would observe much more massiveclusters and many more of these massive clusters than we actually do." The discovery will be detailed in a forthcoming issue of thejournal Astronomy & Astrophysics.